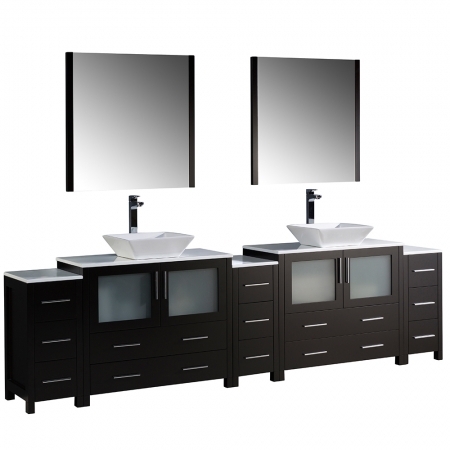 For style and functionality, this double sink vanity brings a lot to the space. 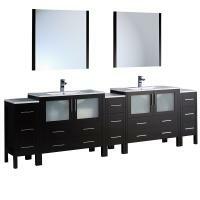 The dark espresso finish of the base is accented with chrome hardware pulls as well as the frosted cabinet door inserts. The rectangular tapered sink vessels sit at the ready atop the white ceramic counter top. With interior shelves within the cabinets and thirteen drawers, this piece will have space for everything to be stored away neatly in the bathroom. This model also includes matching mirrors to complete the look and add even more great functionality. High quality materials ensure years of great use out of this ensemble.